We enjoyed our Valentine’s tea party this week, especially sampling all the cakes! Thank you to everyone who attended and also those who supported our raffle. Approximately £100 was raised for the Residents Activity Fund. 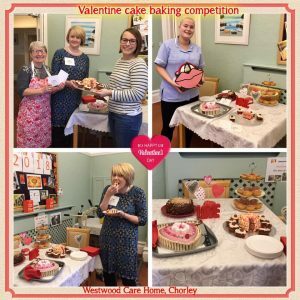 Photos show our judge Julia Bass with first place winners in the baking competition – Barbara and Janine, and in the second photo staff member Emma who won second prize. Third place went to staff member Sara and son Aaron. Well done everyone who took part!